It’s January in Alaska and over the past few winters that have meant freezing rain and icy roads, but not this winter. This January we have been blessed with some delightful snow fall. Some may say it is too much, but for the inner adventurer in all of us, this means it’s time to hit the slopes and enjoy what we have been given. The best place to ski in Alaska? 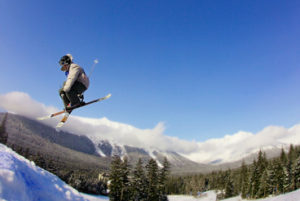 Alyeska – Alaska’s major ski resort only forty minutes south of Anchorage. Alyeska is located in a beautiful quaint town called Girdwood. A must see whether you are visiting Alaska for the first time or the thirtieth. On average this January we are getting 2 ft. of snow a week and that’s recorded right at the base of Alyeska. So if you are looking for steep and deep, Alyeska will surely fit the bill. Advanced and expert riders rave about the steep trails like the North Face and the infamous Christmas and New Year’s chutes. Alyeska also has lots of hike-to-terrain above the lifts, although these zones are commonly closed due to excessive snow and avalanche risk. They do have beginner and intermediate runs for those you aren’t quite as adventurous. The resort is reasonably priced for day tickets, $45, and they do have equipment rentals. In between runs warm up with coffee and a cinnamon roll at The Bake Shop, a popular local hangout. At the end of the day, unwind at one of the many restaurant or bars in and around the resort. Chair 5 for tasty pizza or the Double Musky Inn for ragin’ Cajun are a couple of good bets. Alyeska is not the only place to go skiing here in Alaska. In fact, there is a smaller but still satisfying mountain here in Anchorage people love to go to and that is Hilltop. 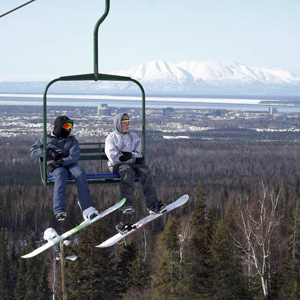 Since it is in Anchorage it is a great option for someone that wants to go skiing for a couple of hours or so just to say they tried it. The runs on the hill are quite easy which makes it a great place to learn, or if it’s just been a while, a great place to get your ‘Sea Legs’ back before heading out of town to something bigger i.e. Alyeska. Hilltop is a little cheaper with tickets running around $22 and they have equipment rentals available as well. For the ultimate in adventuring, give heli-skiing a try with Chugach Powder Guides. The Chugach mountain range has some of the most spectacular terrain in the world. The guides at Chugach Powder Guides will make sure skiing with them will be the best you’ve ever done. We have been blessed so far with snow this 2017 and its suppose to carry through until March. So whether you’re already up here, have a trip planned or are thinking about it, we suggest you hurry because skiing conditions right now couldn’t be better and it’s time to take advantage. ← Are There Really 50 Words for Snow?